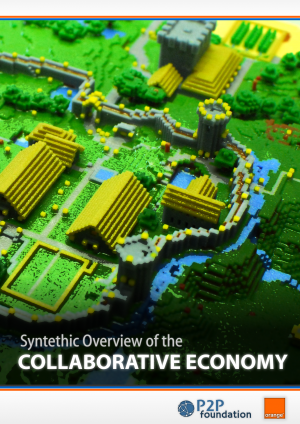 * Report: A Synthetic Overview of the Collaborative Economy. By Michel Bauwens, Nicolas Mendoza, et al. Orange Labs and P2P Foundation, 2012. Bauwens, M., Mendoza, N. & Iacomella, F., 2012. Synthetic Overview of the Collaborative Economy, P2P Foundation. Available at: http://p2p.coop/files/reports/collaborative-economy-2012.pdf. "For anyone scratching their head about how to understand the deeper social and economic dynamics of online networks, a terrific new report has been released by Michel Bauwens called Synthetic Overview of the Collaborative Economy. Michel, who directs the Foundation for Peer to Peer Alternatives and works with me at the Commons Strategies Group, is a leading thinker and curator of developments in the emerging P2P economy. From a commons perspective, the most interesting discussions are in Chapter Two and Three – “Discovering the User as a Value Creator and the Emergence of a User-Centric Ecosystem,” and “Infrastructures for ‘Sourcing the Crowd’ and Mutualizing Idle Resources.” This topics have been covered by other authors, of course, but the virtue of the Bauwens report is its admirable succinctness and overview in assessing these developments. The report amounts to a sampler of the “best of” such analysts as Clay Shirky, Yochai Benkler, Chris Anderson, Eric von Hippel, Henry Chesbrough, John Wilbanks and many other pioneering thinkers of the digital world. "Two main agents of transformation guide this work. One is the emergence of community dynamics as an essential ingredient of doing business. It is no longer a matter of autonomous and separated corporations marketing to essentially isolated consumers, it is now a matter of deeply inter-networked economic actors involved in vocal and productive communities. The second is that the combined effect of digital reproduction and the increasingly 'socialized' production of value, makes the individual and corporate privatization of 'intellectual' property if not untenable, then certainly more difficult , and in all likelihood, ultimately unproductive. Hence the combined development of community-oriented and 'open' business models, which rely on more 'social' forms of intellectual property. In this work, we therefore look at community dynamics that are mobilized by traditional actors (open innovation, crowdsourcing), and new models where the community's value creation is at its core (the free software, shared design and open hardware models). We then look at monetization in the absence of private IP. Linked to these developments are the emergence of distributed physical infrastructures, where the evolution of the networked computer is mirrored in the development of networked production and even financing. Indeed the mutualization of knowledge goes hand in hand with the mutualization of physical infrastructures, such as collaborative consumption and peer to peer marketplaces, used to mobilize idle resources and assets more effectively." "Chapter One creates a frame of understanding with some general characteristics of the whole field. In order to do this, it attempts to create a general grammar to ease the understanding of the varied phenomena that will be discussed in the rest of the report. It tries to uncover the fundamental drives and explains the basic interconnected concepts. It ends with a first approach to a categorization of the different expressions of the collaborative economy. Chapter Two looks at user innovation dynamics, and describes how the corporate world has answered their challenge. We examine the emerging figures of the more active 'user' which replaces the traditional figure of the consumer, and sociological categories such as the professional amateur and the lead user. The chapter describes how corporations have adapted by initializing open innovation and by integrating practices for co-design and co-creation of value in their own value chains. We also look at the more independent user-generated media practices, which have been facilitated with the emergence of social media. In Chapter Three we look at two of the new 'diagonal' or 'hybrid' approaches. These hybrids combine entrepreneurship with more horizontal participation, and deepen of the mutualization of both skills and materials. In the case of crowdsourcing, firms appeal to the crowd for both creative/innovative input and for more service-oriented tasks; we try to make sense of this complex ecology. We also look at the emergence of collaborative consumption, in which physical resources and services are mutualized, in order to mobilize hitherto underutilized idle resources. Practices of mutualization characteristic to collaborative consumption also to render existing services more ecologically efficient, as for example in car sharing. We are witnessing here a more profound shift: from ownership to access: this is, access to a wide variety of services. We look at the new possibilities for (dis)intermediation that it generates, but also at the peer to peer marketplaces that it enables. In Chapter Four we look at the more radical community-centric production methods, i.e. the emergence of commons-based peer production, where participating firms have to adapt more stringently to the rules and norms of the initiating communities. After defining peer production, we look at the various ways in which community and corporate dynamics interpenetrate to create a dynamic field of hybrid economies. We also look at the cultural penetration of these new practices and the current shift of their reach from the more immaterial creation of knowledge and code, to actual physical production through the sharing of designs, as is emerging in the fields of open hardware and distributed manufacturing. In Chapter Five, we look at the infrastructural underpinnings which enable the new forms of distributed production. These range from the very material development of personal fabrication and 3D printing machines culminating in new possibilities for microfactories, but also distributed funding, new accounting and metric systems to measure distributed development, and new hybrid legal forms. These new hybrid legal forms integrate for-profit and non-profit motives, with more potential to generate contributing communities. Chapter Six is an overview of 'open' (i.e. based on shared intellectual property) and community-based business and monetization models. It answers the crucial question of financial sustainability in the absence of strong IP-based rent income." "The theme of the following work is the horizontalisation of productive human relationships that has been enabled through communication networks and in particular the Internet. These productive publics can generate their own practices and institutions through bottom-up dynamics, or they can be mobilized by existing institutions. Hence the emergence of the collaborative economy, which comes with many names and with different expressions, such as commons-based peer production (Yochai Benkler), wikinomics (Don Tapscott), crowdsourcing (Jeff Howe), open innovation (Henry Chesbrough), collaborative consumption (Rachel Botsman), and quite a few others. Different authors have mapped the outlines of those particular expressions of the collaborative economy, but we believe that an overall synthesis was still lacking. While a full account would be a tremendous undertaking, we do believe that the following work captures the essence of developments in this field, which represent a deep transformation of economic practices. This work is of course indebted to those who have described, analyzed and mapped its various expressions separately, and we have used their work to form our own synthesis. Amongst the works we have used more particularly are We Think, by Charles Leadbeater, What's Mine is Yours, by Rachel Botsman, and Getting Results from Crowds, from Ross Dawson. Others have written synthetic essays that were just as crucial in mapping out particular fields or particular aspects. We cannot mention them all separately here, but they are all referenced throughout the text. This project was undertaken by Michel Bauwens as lead researcher, but was truly a team effort. The P2P Foundation team consisted of Nicolás Mendoza (Colombia) and Franco Iacomella (Argentina), with further assistance from James Burke (Netherlands) and Chris Pinchen (UK). We developed a Case Study appendix focused in France with help from Antonin Léonard and Edwin Mootoosamy. We also had a secret weapon, Valerie Peugeot of Orange, which played a tremendously active role in guiding, correcting and suggesting avenues for our research. She was truly an extra member of the team, operating as a peer, and not just as a client. We thank Orange Research for ordering and funding this synthetic overview of the collaborative economy. This report is comprehensive and very dense with information and analysis. At the same time this is a continuously evolving and very complex field of emergence, and as such, the study is just one step in comprehending an evolving social and technological transition. What we hope is that this is therefore also a good stepping stone for further research efforts." "Within the Social and Human Sciences Lab of Orange R&D, the Research Object Futurology is in charge of detecting and analyzing changes in northern and southern societies – whether their sources are of economical, cultural, technical or social nature – that could impact the Telecom ecosystem, in the mid and long term. At the heart of our economies, a diversification and increasing importance of collaborative practices can be observed. By proposing alternative paths of value creation and sharing, these practices open new perspectives in terms of consumption, production and innovation models. The players of this emerging collaborative economy are diverse: their objectives, attitudes towards collaboration and sharing, their methods of work as well as their business models are heterogeneous. Consequently, it seemed essential to us to have a mapping of those actors and their initiatives. We have asked the P2P foundation to take the task for elaborating this cartography. Being both at the same time a long time observer and a promoter of these new practices, the Foundation provides us through this report a perception “from the inside” of the collaborative economy. We would like to thank here all the team of the Foundation, and in particular Michel Bauwens its senior researcher, for their commitment in this project and for the quality of this report. Being as comprehensive as possible, it provides useful elements to structure this complex and rich world and highlights possible opportunities for an operator. It should be a precious tool for the continuation of our works." "In the last decade or so, many new collaborative practices seemed to have emerged in the business world, ranging from open innovation, co-design and co-creation, but also crowdsourcing, collaborative consumption. With some exceptions, these practices can be interpreted as 'emergent' and they are still mostly marginal in their economic weight relative to the mainstream market economy, with some exceptions however. For example, the open content and open source economy has already been estimated to be one sixth of U.S. GDP, and certain practices, like grouped buying in China, may have a strong local weight in some national economies. In parallel with these collaborative practices and the mutualization of knowledge through open source practices, there is also a very visible growth in distributed infrastructures for material production, such as the rapid evolution of micromanufacturing through 3D printing, the rapid growth of collaborative workplaces such as in coworking, and new modalities of distributed financing, such as crowdfunding and social lending. What is also important however, is the inter-relatedness and interdependence of this various phenomena, which seem to reinforce each other. They are all linked to each other, because they are the direct or indirect result of the horizontalization of human relationships and the modalities of cooperation they engender. Hence, next to the mainstream economy, consisting of mostly 'vertical' organizations, and, next to the informal and more marginal growth of 'pure' horizontal value creation practices, what is also occurring is the emergence of hybrid models, wherever the horizontal and vertical modalities encounter each other, and mutually influence each other. Hence, there is no question that mainstream business practices will be impacted even more by this horizontalization in the future, and that a diagonal adaptation to these challenges will be on the order of the day. What follows then, will be a synthetic mapping and overview of the different manifestations of the emerging collaborative economy. While there is a literature describing the various 'individual' manifestations of this 'collaborative economy', what has been lacking is a integrated mapping of these inter-related phenomena, with a view of understanding their overall interconnection. It is to this task that this overview report is dedicated. The authors of this study, researchers at the P2P Foundation, which is a specialized observatory into the collaborative economy, have collated for over five years the empirical evidence on its emergence. Hence, this report contains an extraordinary richness of concrete examples that are witness to the reality of this shift. On the other, the Foundation is also an advocacy organisation of behalf of these collaborative practices. Hence this report may contain an optimistic bias, with a bit more attention to the drivers of this change, rather than to the obstacles. Nevertheless, in order to arrive at a better understanding of these trends, which may not be obvious to the non-specialized observer, this may be an advantage as well, since it brings to light many under-reported developments. There are two ways to read or enter this report. One way is to read this report for its encyclopedic survey of the various sub-phenomena. For each, you will find definitions, descriptions, and the necessary typologies to understand its deployment. Special boxes outline some extra details, or give concrete examples in practice, and there are also bibliographic references for further reading. All examples and references are sourced, and can generally be find on the Internet. Readers who have a particular interest, may fruitfully read the particular chapter corresponding to it. On the other hand, the aim of the report is also to offer an overall synthetic understanding, a metaanalysis of how the different emergent phenomena are connected to each other. This is also what we try to do in the very first chapter. However, some readers may prefer to read the specialized and more concrete chapters first, after which our analysis will make more sense. They can thus leave the first chapter for last." There is no longer any excuse to remain ignorant of the vast peer-to-peer landscape that is slowly but surely replacing the obsolete, monopolistic, and competitive institutions of yesterday. This authoritative survey of the emerging collaborative economy may shock businesspeople and scare bankers, but it sure encourages me. - Dr. Douglas Rushkoff - author, Life Inc and Program or Be Programmed. Are markets retreating, after decades of expansion, even as the public sector shrinks as well? There are two new ways in which they appear to retreat. One is the de-commodification of products. Things that used to be produced for exchange-value in the market, are now produced for use-value within communities. Wikipedia is the clearest example. It de-commodified general purpose encyclopedias. Open Access is doing the same to scholarly publications. Linux has been doing this to operating systems, Drupal for content management systems, etc.